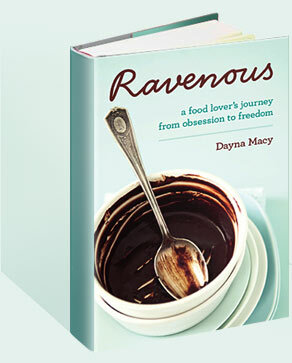 2007 July — Dayna Macy, author of "Ravenous"
Tomorrow I take my first piano lesson in 35 years. My boys have been studying piano for the past few months with the incomparably wonderful Max Cowan, and I decided, why should they have all the fun? I’ve been playing guitar since I’m ten, but the truth is, I’m a singer, and not much of a guitar player. I was recently listening to Joni Mitchell’s “River,” and fell in love all over again with her wild suspended chords — magnificent and lush, full of hope and loss — just like life. They get me where I live. Matthew, Jack and I went blackberry picking this morning up in Tilden Park. They showed me their favorite “treasure trove” of bushes. We were intrepid (and have the scratches to prove it). We picked about 5 cups of blackberries, and were all smiles as we emerged from the thicket. In a separate bowl, mix all above ingredients. Add 1 beaten egg. Mix together until crumbly. Butter the bottom of a 9×9 baking pan. Add filling. Crumble topping over it. Pour melted butter over topping. Bake for 30-40 minutes. Make sure topping doesn’t burn. I recently ate a wonderful dish of mussels in tomato shallot broth at the seafood bar in the Ferry Building. I decided to recreate the dish at home, which is notable only because I have a fear of cooking shellfish, based on nothing in particular — I’ve just never done it. (You can add rolling pastry dough and baking yeasted breads to that list). So I took out my trusty “Joy of Cooking”, read up on cleaning and cooking mussels (scrub and steam), and went to my local fishmonger to buy some. “It’s not mussel season”, the fishmonger says. Perhaps it’s obvious to most people, but I didn’t know mussels had a season. Now I do. Though I really wanted to eat mussels last night, there’s also some good that comes with not being able to eat what you want when you want it. Just another reminder that we humans still have a place within nature’s web, and gratification sometimes has to wait until nature is ready to give it. My whole family just returned from Ratatouille – the brilliant and lovingly made Brad Bird/Pixar movie about a creative genius of a chef named Remy, who just happens to be a rat. Quelle inspiration! Vive la cuisinne magnifique! !